Low Headroom kelly bars. 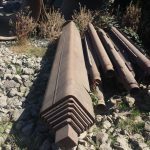 18″ square outer kelly bar X 16′ length. 7 element multiscope with 6″ kelly foot” rated for 150,000 ft/lbs of torque complete with square kelly drive… not shown.